Social media marketing has always been an excellent way to drive traffic to our blogs. And as you might know, Facebook and Pinterest are the best referrers of website traffic. However, what most of us ignore is Google Plus, which has recently grown hugely with over 250 million dedicated users. Google plus overtook LinkedIn in 2014 in terms of referral traffic. It recently revamped itself to give competition to Pinterest. Google Plus has always been a favorite to marketers and influencers apart from the common people. I have been using Google Plus all this time, and I must say marketing your blog on this platform definitely boosts traffic. In past one year, I got almost 9K traffic alone from Google Plus and now it is my second referrer of traffic after Facebook. So, do you want to tap into this resource of targeted traffic? 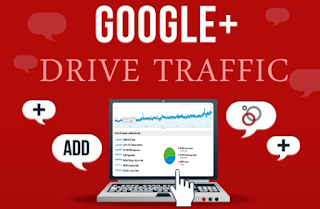 Here are the exact 7 steps by which I drive massive traffic from Google plus (and you can too). Google Plus is one of the few social networks that allows you to customize your post, make it more appealing and thus enhance readability. With formatted posts, users can clearly see what they are expected to do. Google Plus allows you to bold your text highlights to make them eye-catching. You can also use italics, strikethroughs, numbered lists, bullet points or any combination of these styles to make your update resemble your blog posts. 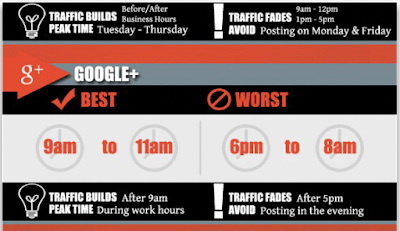 Here is a cheat sheet by Moz that shows how you can make your Google Plus updates stand out. 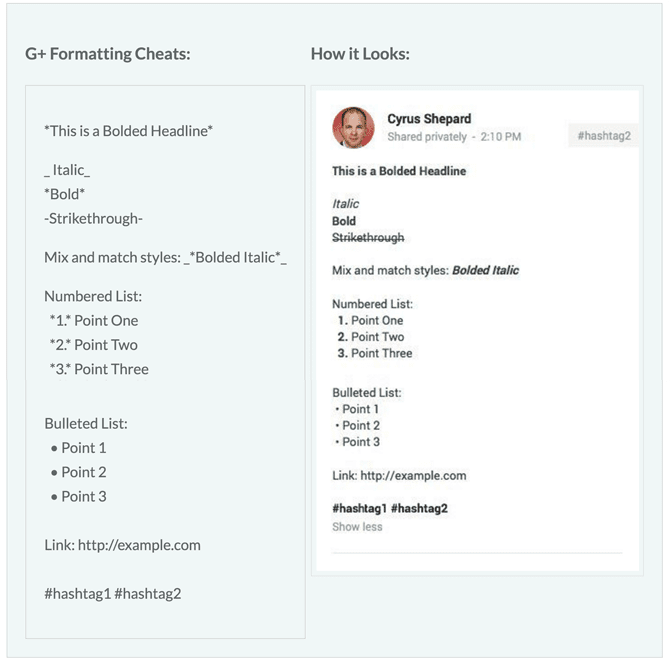 How to use text formatting in Google plus to your advantage? 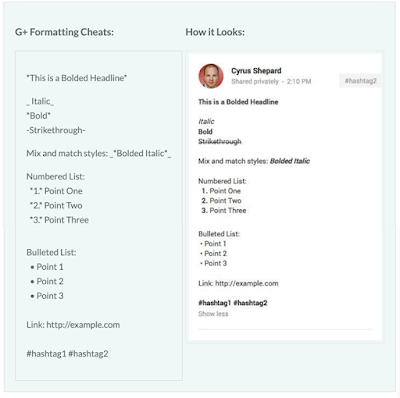 - Use bold headlines to mark your article headline on google plus. - Use the italicized text to give a sleek preview of your post. - You can use the bold text again to give a clear call-to-action for your readers. This can be a simple CTA to direct your users to read your blog post or even to buy the product if you are doing affiliate marketing. You might have the best-formatted posts and excellently designed images, but if no one sees it, you will fail. Using Hashtags in any social network increases the lifetime and reach of your updates. Similarly, you can use relevant hashtags in Google Plus to increase the reach of your posts and hence more traffic. If you don’t have any idea of what hashtags to use, you can start typing and Google Plus will autosuggest you the relevant ones. Google Plus also automatically keeps up to 3 hashtags if you don’t have any. HINT: If you want to know which hashtag is yours and what Google has automatically set for you remember, gray is by you and blue is by Google. 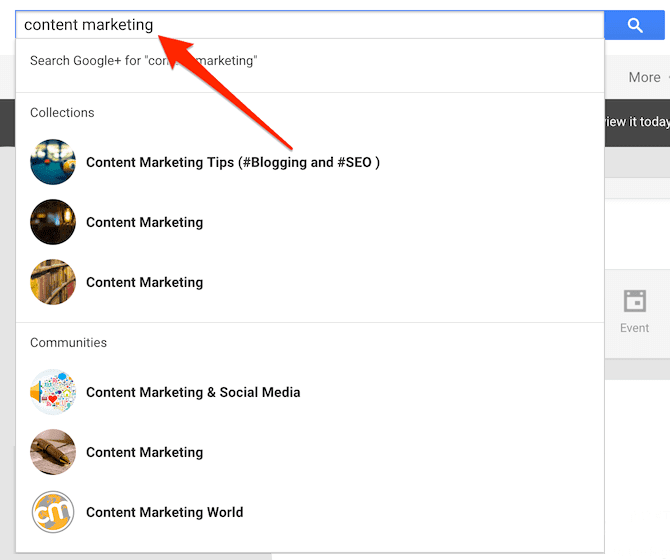 With Hashtags, Google Plus might suggest your posts in “What’s hot” section on their platform, thereby showing your posts to way more people, even if they are not connected to you. In the below image, you can see how Ann Smarty is suggested with a user who is not connected to her but still is relevant in terms of hashtags both use, country and the mutual friends they share. Quite a good way to connect with more like-minded people. - Use hashtags relevant to your industry in your upcoming Google Plus updates. - How to find hashtags? 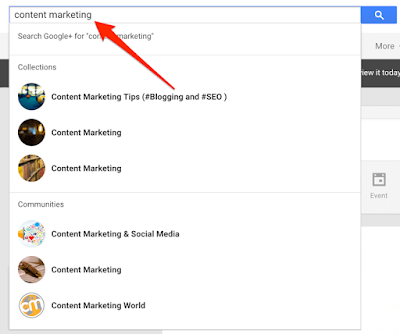 Use the Explore feature of Google Plus to know what is trending in your niche. Google Plus is an excellent way to engage with like-minded people and businesses. Brands are even using Google Plus to interact with their fans and consumers. If you want traffic and visitors from in there, you have to open up yourself. Try interacting with people and make your posts compelling so that even strangers will take a look at your posts. Here are some strategies, most social media influencers including Rebekah Radice (social media expert and global brand ambassador of PostPlanner) use. Google Plus offers you a very wide range of posts formats to bring the flavor out of your posts. You can post text updates, videos, conduct polls, include authentic music via Soundcloud and even post mini versions of your blog posts directly. Bring in variety by posting quotes, animated gifs (work well with Google Plus) and sometimes thoughtful questions. Timing is very essential on any social media platform. To get maximum engagement, you have to post your updates at a time when the majority of your fans are online. If you fail, your posts will be buried under fresh content when they come online the next time. Google Plus doesn’t allow scheduling to profiles yet, but you can do so with business pages. Or some hacks using IFTTT. 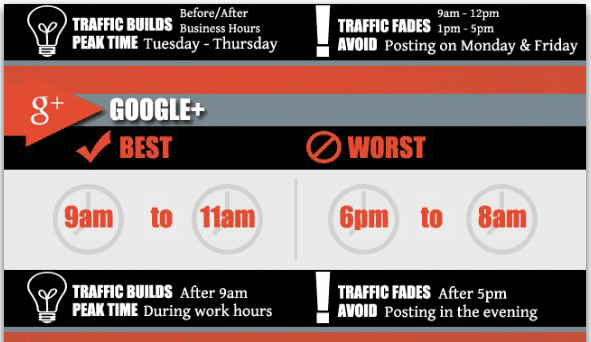 The peak time for posting content on Google Plus is between 9am-11am and the worst time (when you have zero interaction) is 6pm-8am. You can also choose your own time by analysing your existing post interactions using a tool called timing+. Want a truckload of traffic just after posting your next Google plus update? This next two tricks will help you get tons of targeted traffic from every single post! Like Facebook groups, Google Plus has highly active, close-knit communities which can give you massive exposure. Some of these groups have more than 100K members and have high chances of getting significant traffic if you post valuable posts. 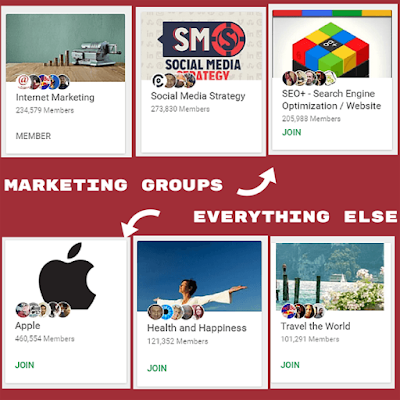 There are groups on almost every niche on Google Plus, and you can join them like a breeze. You can also create a group for you if you think yours doesn’t fit any community out there. To get access to Google plus communities, you can search your direct keyword in the search bar on your homepage. Google Plus will them show you all the collections (we’ll come to this in the next point), communities and direct profile shares. 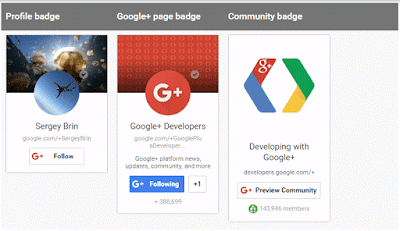 You can always click to view more on Google Plus to see more communities. - Don’t waste time creating your communities, leverage existing communities to get instant traffic. - Interact with other members, view their shares and build lasting relationships. - Abide by the rules because communities moderators are very strict with spam dealings. Google Plus collections are similar to Pinterest boards where you sort out and categorize similar posts. If you share valuable updates, industry news or even image posts you can use this feature to get tons of followers. The difference between Google Plus collections and communities is that, in collections, you can post, and people will follow them to keep updated. You can also move your existing posts to appropriate collections you own. The collections you mark “public” will be followed by all your existing connections by default. So you have some eyes before starting out itself. - Use collections to give your fans a dedicated taste of what they want. If you have a board on SEO, share excellent resources on SEO to your fans. If you have something related to say, Game Of Thrones, be sure to keep it updated with all the latest news, buzz and gossip so that people tune into your collections whenever they are online. - Sort out different ideas to different collections like freebies to a different collection, inspiring success stories in your field in a separate collection, etc. - Read this guide for a detailed tutorial on Google Plus collections and how you can drive traffic from it. Driving traffic becomes easier when you have authority. Google Plus helps you stay in the good books on Google, the search engine and hence more organic traffic. When you are logged in (which most of your readers are! ), Google shows you two out of the ten search results as updates from people in your circle. This is huge if you have a good following or even have a large number of people share your stuff on Google Plus. Suppose “A” wants to search about online cakes on Google. She might not know you as the cake seller but can have you in the search results because someone “B” in her circle had read your website and shared it on their Google Plus. This might not seem big but still has to do with organic traffic. To tap further, you have to optimise your website/blog for that extra Google Plus love. Using Google Plus share button is a good way to tell your readers, where you want them to share it. To get more followers, you can leverage your existing website traffic by just adding your google plus profile and page badge on your site. You can also add simple social media profile buttons but adding badges make them more commanding and easy to follow you. Use this plugin or this tutorial to manually create a badge for your site. Using Google Plus comment system is quite a good way to direct your existing interaction to Google plus and therefore increase your visibility there. Moreover, Google Plus comments have the option that enables your visitors to share the post directly which commenting. Please Note: Using a third-party comment platform might take away the ownership to comments on your blog, but you can still have both to see what your readers prefer. 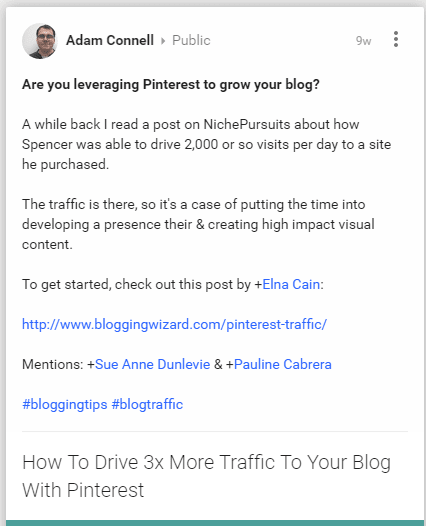 You can also use Google Plus to connect with influencers, brands and other big names that can give your blog a boost and help you gain some awesome traffic. 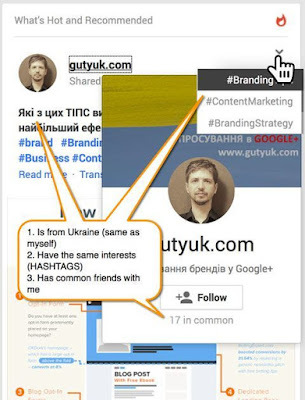 Tagging influencers (mentioned in your posts) on Google Plus updates can bring you under their radar and if you manage to impress them with your content they can bring you good traffic. This is the easiest method of influencer outreach since you do not have to hunt for email addresses or wait for days to get a reply from emails. It's either boom or forget this and set another. Check out how Adam Connell uses outreach in Google Plus. This tool is a gem since it helps you to leverage your effort in Google Plus marketing to other platforms. It is a set and forget tool that helps you to reshare every post you share on Google Plus to your business page, Facebook, Twitter and LinkedIn. Automatically! It is a free analytical tool that can help you analyze your Google Plus account, build authority and see what your competitors are doing. This Chrome extension suggests you what brands and influencers you need to follow on Google Plus to get the right amount of visibility. This was what I did to drive approximately 9.7K traffic from Google Plus within a year. With this guide, I hope you better your Google Plus marketing strategies and get traffic from there. Google Plus traffic is always relevant since you won’t find the unrelated audience in there. To get the optimum traffic influx from Google Plus optimize your profile, post relevant content and connect with the right people. This may seem simple and unuseful, but once you do it, you’ll know the value of traffic you get.